LeBron is trying so hard to embrace his new role as the villain of the NBA, but it’s not working. LeBron enjoys going on the road and getting booed. In fact, he is actually playing better on the road than he is at home. Once I read that, the first thing I thought of was Dan Gilbert, the Cavaliers owner who posted an open-letter on the Cavaliers website within minutes of LeBron’s decision to leave chilly Cleveland for sunny Miami. In the letter, Gilbert called James the “former hero;” he called LeBron’s decision a “cowardly act of betrayal” and vowed that the city of Cleveland will win an NBA championship before the “self-titled former King” won one. When asked to clarify his confusing comments, James and the questions were cut off by a member of the Heat public relations staff. LeBron, if you are going to be the villain of the NBA, you need to embrace it. You need to own up to your “tweets” and man up and say, “Yes, I wrote that. It was directed towards that Cavaliers and most importantly Dan Gilbert.” But you won’t see Lebron saying that, and you know why? Because he’s too worried about what people think about him. LeBron is being booed in cities that never had a chance to sign him (New Jersey and Memphis to be exact). 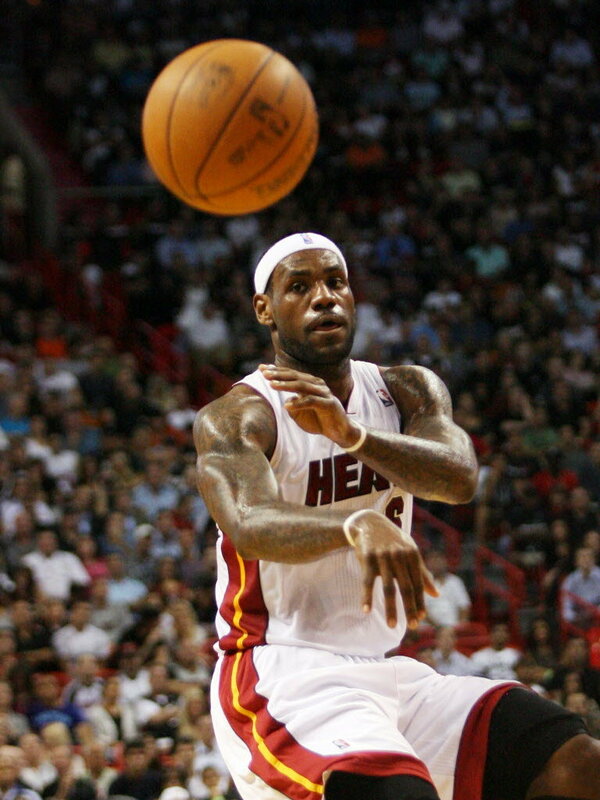 LeBron is playing better on the road than he is at home. I think that the boos ignite his fire, and he cranks it up from there. LeBron is averaging nearly 28 points per game on the road, compared to his 22 points he drops at the American Airlines Arena. Although some people believe that LeBron has already embraced his “inner Anakin” and is the official villain of the NBA, I see it otherwise. LeBron is trying to be a villain, but when it came time for him to officially be known as the “bad guy” and own up to his tweet, what does LeBron do? He takes the easy way out and says he “re-tweeted” from another friend. Villains don’t do that, LeBron.